Full on, non-stop martial arts action - old-school style. A troop of monks from the Shaolin Temple embark on a mission to get the Golden Sutra to Tibet after the Shaolin Abbot is killed by their traitorous teacher. They are joined on their quest by a beautiful, female warrior, out to avenge her father's death. They traverse forests and mountains on their mission, all the while fighting off deadly ninja assassins, vicious gangsters and even the undead. 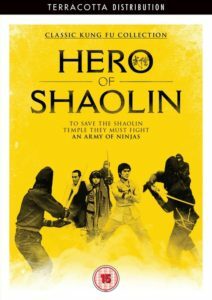 An undiscovered gem, unearthed and restored, Hero of Shaolin is a must see for Kung Fu fans.